It’s never too late to achieve the smile you’ve always wanted. Adults with crooked or awkwardly spaced front teeth now have a fast, comfortable, and convenient orthodontic solution. Invisalign® clear aligners discretely realign teeth to create beautiful, healthy smiles, all without interfering with your day-to-day life. Using the latest technology, Dr. Salivonchik can help you achieve the smile of your dreams without the hassle or time need for regular braces. To get started, contact us today. Why Choose S. John Salivonchik, D.M.D., P.C. 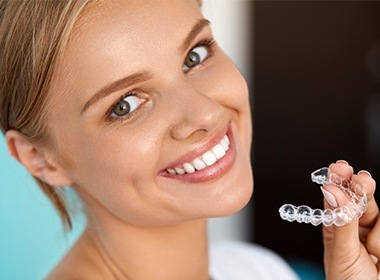 for Invisalign® Clear Aligners? As an Invisalign-certified dentist, Dr. Salivonchik will examine your teeth and assess your straightening needs at your orthodontic consultation. 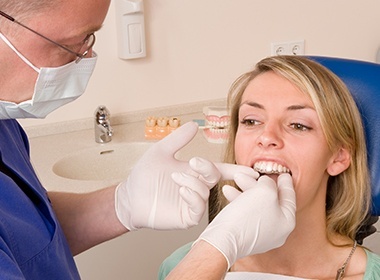 You may qualify for Invisalign if your teeth are crooked, widely space, or crowded, or if you have a slight bite misalignment. Invisalign® employs custom-made, plastic aligners instead of metal brackets and wires. Each pair of comfortable aligners exerts gentle pressure to shift teeth into their ideal presentation. Because the aligners are removable, patients eat what they want and easily clean their teeth. 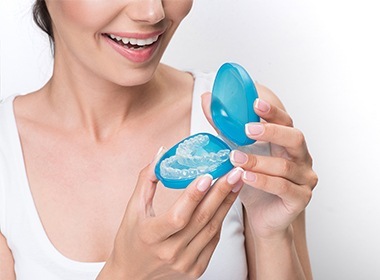 The smooth edges of the aligners mean that sensitive oral tissues won’t become irritated – a side effect that often occurs with traditional orthodontia. To plan your treatment, Dr. Salivonchik will take a dental impression to send to the Invisalign lab. After you receive your custom series of aligners, you’ll wear each pair for about two weeks until you achieve your treatment goals. Many Invisalign patients complete treatment in less than a year, although individual treatment time depends on the unique requirements of each patient.